Please note that all the quotes in this review are from an Advanced Reading Copy of the book, and could change in final publication. A story within a story, The Last Bookaneer is a tale of piracy. Book piracy. Set at the end of the 19th century, the majority of the tale is bookseller Mr. Fergins relating his last great bookaneering adventure with the young, impressionable Mr. Clover. I suppose I should stop here in my review and answer your question. What exactly is a bookaneer? Bookaneers are the pirates of the publishing world. The bookaneer hunts down elusive manuscripts, or even simply books that have been published overseas and do not enjoy protection abroad. In short: a bookaneer is a person capable of doing all that must be done in the universe of books that publishers, authors, and readers can have no part in – must have no part in. Bookaneers would not call themselves thieves, but they would resort to almost any means to profit from an unprotected book. In Mr. Pearl’s tale, there are three great bookaneers – Pen Davenport, Kitten, and Belial. By 1890, Kitten is dead, and copyright laws are about to change. There is a chance for Davenport to embark on one last, great bookaneering adventure to the island of Samoa, where Robert Louis Stevenson is living and writing his final masterpiece – but he’s got to beat Belial to it. The story moves between New York, London, and the Island of Samoa in the South Seas. Mr. Pearl was excellent in painting the picture of the historical contrasts on the Somoan island of of Upolu. Clashing native tribes. White missionaries. Germany trying to take over the island. Cannibal slave runaways. Dense forests. Vailima, Stevenson’s huge estate (with the island’s only fireplace). Mr. Pearl takes the actual history of Upolu and Tusitala (“Teller of Tales,” Stevenson’s Samoan name), and inserts his bookaneers right into their story. It is always in the parts that we cannot fully understand – the holes in a story, the piece missing – where the real truth of the thing lurks. This quote is twofold for The Last Bookaneer. 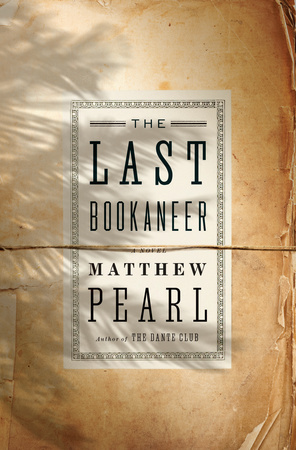 Mr. Pearl uses holes from history to invent the truth of his story. It turns out that this is also true in the case of the final bookaneer adventure as well. Fergins’ tale comes to an abrupt end, leaving Mr. Clover with questions and no one to give him answers. A few years later, Mr. Clover has the opportunity to discover the end of the story, filling in the missing pieces for himself and the reader. I found the writing style to be beautiful. Mr. Fergins’ love for books and the sharing of a good story keep Mr. Clover (and the reader) captivated. This book was one I could pick up and get lost in for a bit, then set back down and return to it again later. It was only about the last third of the book where I felt an urgency to keep reading and finish. While I enjoyed this book, it wasn’t a 5/5 for me. I think it’s because of the occasional rant against publishers throughout. Those bits took away from the story. Otherwise an enjoyable adventure in the South Seas. Thanks to the First to Read program for giving me a copy of this book in exchange for an honest review. Definitely adding to my TBR!